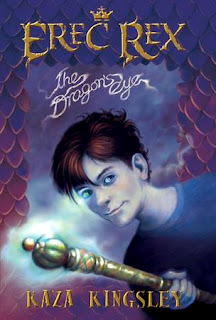 I just finished reading Eric Rex: The Dragon's Eye, a wonderful young adult fantasy book by Kaza Kingsley. Starting next week Kaza is going to be going on a blog tour to promote the second book in her series entitled Eric Rex: The Monster of Otherness. My blog is one of the stops on Kaza's tour. I am very excited to have been asked to participate in this event. Kaza will be checking my blog daily to answer any questions, comments, etc. that are posted to my blog. So start asking questions!!!! In the upcoming days I will post questions and answers from Kaza regarding her books, life as an author, etc. So continue to check out my blog for updates! Great Interview. Can't wait for the next book. I love finding out what the mind of a real writer is like. I love writing with my friends and we love reading The Erec Rex's books. When we're writing we make the character have the same personalities as us. One time we acted out the characters of the Erec Rex book we had so much fun.